Walking on the Long Beach boardwalk on the South Shore of Long Island back in 2004, I stumbled upon an ocean sailing race known as the Spirit Rider Regatta. From that day, when I met Noreen O’Keefe Costello, President of the O’Keefe Foundation, I’ve been involved in this unique, spirited event every year. The race, hosted by The Ocean Club in Atlantic Beach, NY on the first weekend after Labor Day each year, began in 2003 in memory of firefighter Patrick J. O’Keefe, a member of FDNY Rescue Company One. Patrick, who lost his life in the World Trade Center on September 11, 2001, had a true love of sailing and consistent generosity to introduce others to the water. In 2008, I met Maryann McCruden, Commodore of the Point Lookout Yacht Club (PLYC) at the time, and was invited to join her all-women crew for the Spirit Rider Regatta. I’ve been racing on Maryann’s Pearson 30 Windancer through the present day. Now, as the current Commodore of the PLYC, I am proud to say our club represents 50 % of the racing fleet for this regatta. Noreen tells me that according to the West Point Sailing Team’s historian, the Spirit Rider Regatta is the only 9/11 memorial regatta in the United States. The purpose of the race is to honor and remember all those lost in the attacks in 2001, and to continue to foster the spirit of brotherhood by helping struggling high school seniors attain a college education. “All of the proceeds from the Spirit Rider Regatta are awarded in scholarships to students who have lost a parent to violence or are suffering from some radical life change,” said Noreen. Personally, it has come full circle as I attended my son’s senior awards presentation at Long Beach High School. Tim O’Keefe, the brother of our fallen hero Patrick, presented my son’s classmate with The Oak Memorial Scholarship award for 2014. A powerful moment. 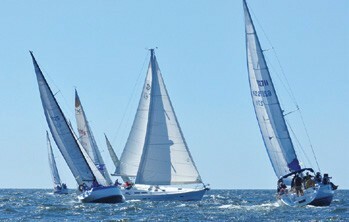 I invite you to join us for the Spirit Rider Regatta on September 7. To register, or to join hundreds of surfers in the Memorial Paddle-Out, please visit spiritrider.org. Ellen Kramer is the Commodore of Point Lookout Yacht Club in Point Lookout, NY.